With the sales tax rising from April 1, the shopping spree that pushed the Breakingviews Abenomics Index to a 12-year high in March has ended. But sluggish wages are a bigger threat than a consumption freeze. If pay disappoints, the spending gloom may become more persistent. 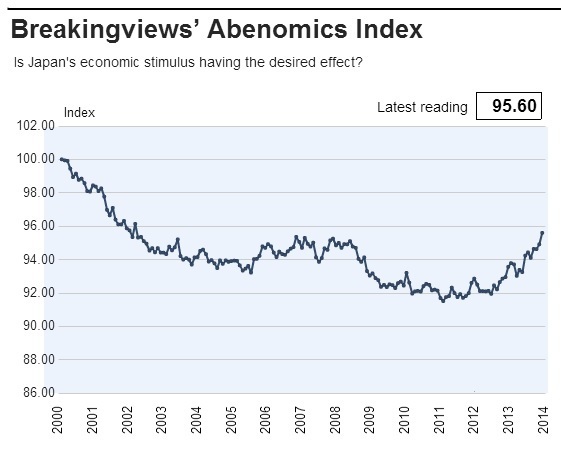 The Breakingviews Abenomics Index rose to a 12-year high of 95.60 in March, up from a revised 94.91 in February. Private consumption led the gains in the index. Among other constituents of the gauge, wages rose moderately from February, after two months of no gains. Manufacturing output increased, bank lending rose and inflation expectations firmed up. Stock and bond prices slipped, housing starts slowed, the current account deficit widened and consumer prices were flat.